Wonderful quilted blanket keeps you warm while you sleep, making so comfortable to luxuriate in bed. But sooner or later it comes time to wash the blanket because it accumulates large amounts of dust and sweat. But many people worry about the same question: can I wash the blanket padding, and if so, how to do it correctly? Probably on your blanket survived enclosing a label, which clearly indicated how and at what temperature it is recommended to wash the product. Modern washing machine-the machine have a huge number of functions and modes of washing. In order to wash the blanket, you must select the correct mode and the temperature of the water (based on labels). Most often, it generally should not exceed 40 degrees on a synthetic material. Use a soft powder or liquid detergent for delicates that do not contain bleaches and chemicals. The blanket padding is able to withstand repeated washing and permanently retain their original appearance, not deformed. Fiber padding in the wash do not form lumps and does not fall off. The material retains the softness, elasticity and recovers quickly. After a thorough rinse and spin options it is quite fast drying. After washing, pull out the blanket from the drum of the washing machine and stretch it slightly. Leave to dry naturally in expanded form, turn it periodically and shake. Recommended to put a blanket wash once in three months. 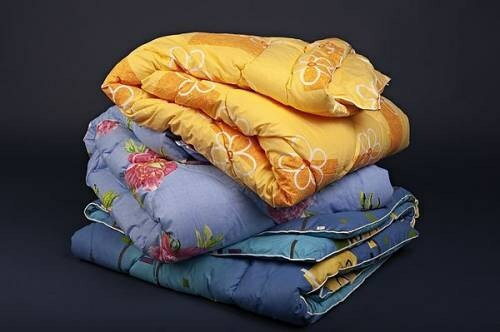 You can wash quilted blanket manually, but it is much more difficult, as when wet it becomes very heavy and without the help of you can not do. Put the blanket in the tub and pour the right amount of water (the temperature should be 30 degrees), dissolved in liquid detergent. As it should, RUB it, you can even take your shoes off and walk through the blanket. Rinse it thoroughly several times and allow to drain. After such washing, the blanket will dry much longer. If your quilt is simply does not fit in the drum of the washing machine or not suitable for weight load, then it is better to give it to the dry cleaners, where for a short time and very inexpensive lead polyester fiber product.